Over the next four weeks, academics and staff at 64 universities across the country will strike in protest against pension reforms. In Cambridge, supervisions and lectures will be affected starting tomorrow, 22nd February, as almost a tenth of University staff begin the walkout. When are lecturers and staff striking? The escalating strike action is organised in blocks of up to five days, for a total of 14 teaching days. Participating staff will walk out from Thursday 22nd February to Wednesday 28th February. The strikes will then continue on the Monday 5th March to Thursday 8th March, and from Monday 12th March to Friday 16th March. What days will the strike land on? Escalating strike action will run until the end of term, meaning walkouts during Weeks Six, Seven and Eight. The Universities and Colleges Union (UCU), the higher education trade union which has organised the strikes, will meet on Friday 2nd March to discuss the response from universities. It is possible that the UCU and the negotiating body for universities, Universities UK (UUK), will reach an agreement during the period of industrial action, in which case the strike action would immediately cease. How might classes be affected? Lectures, laboratories, and seminars – Any faculty-organised, university-wide teaching may be cancelled if the lecturer is participating in the strike action. Teaching officers are not obligated to inform the University that they will be striking – in some cases, it will thus be impossible to know of cancellations in advance. Faculty-based supervisions – Supervisions organised by University faculties and departments are included in strike action, and may be cancelled if the teaching officer is striking. Cambridge UCU recently announced the inclusion of faculty-based supervisions in strike action, a move it says will affect “almost all graduate teaching”. As above, you may not be informed of cancellations in advance. College-based supervisions – Supervisions organised separately within or between colleges will be unaffected, as individual colleges do not have a voice in national negotiations. However, UCU members have been encouraged to avoid giving supervisions on University premises, or to reschedule them to non-strike dates. Speaking to Varsity, Cambridge UCU Secretary Dr. Waseem Yaqoob said he had advised striking members not to inform students too far in advance of their plans to strike “in order to ensure the strike is effective in disrupting university operations”, although he added that students can ask their supervisors whether they plan to strike. Participating lecturers not rescheduling or covering missed classes, or undertaking any voluntary activities related to teaching or research. Working to contract, which entails strict abidance to the terms of an employment contract involving hours of work, breaks, and workload. Actions short of a strike may continue past the 14 days of strike action, lasting until 19th June at the latest. In a letter to students, pro-vice chancellor for education Graham Virgo advised students to assume that teaching “will be happening as normal”, but noted that “some teaching and assessment may be cancelled at short notice”. What does it mean to ‘cross a picket line’? A ‘picket line’ is a real or metaphorical line of picketers at the entrance to their place of work, designed to discourage people from entering the workplace on strike days. Cambridge protesters will picket lecture sites across the city, including Downing, New Museums, Sidgwick, Old Schools, and West Cambridge sites. Speaking at CUSU Council on Monday, Dr Yaqoob outlined the UCU’s stance: “We don’t want to tell students what to do, but by going to any University building they would be crossing a picket line”. He added, “by entering University premises on strike days, even if there isn’t a bunch of members there, you’re breaking the picket line”. CUSU has encouraged students not to cross picket lines in order to demonstrate solidarity with striking academics, but advises students doing so to email the heads of their school and department to establish that they are missing lectures or supervisions in support of the strikes. 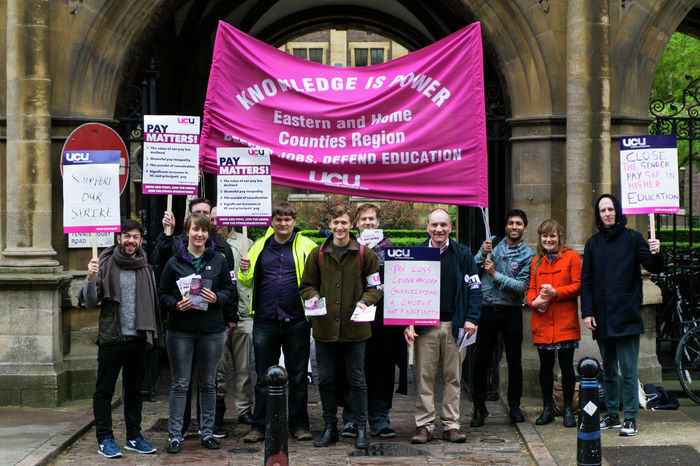 The strikes are the latest development in an ongoing pensions dispute between Universities UK and UCU, after a Joint Negotiating Committee reached a stalemate in January over changes to the Universities Superannuation Scheme (USS). UUK recently proposed plans to replace defined benefit pension schemes for university staff incomes under £55,000 with defined contribution pension schemes. The value of defined contribution schemes depends on returns from underlying investments in the stock market, as opposed to defined benefit schemes which offer a guaranteed income upon retirement. In an interview with Varsity last month, Dr. Sam James, J. H. Plumb college lecturer at Christ’s, described “how angry and frustrated [members] are about the scale of degradation” in pension values. The UCU has cited analysis by actuarial consultants First Actuarial that staff could be as much as £200,000 worse off under defined contribution schemes. The UUK proposed the changes in response to growing financial difficulties in the USS, citing a deficit of £7.5bn. The elimination of defined benefits also enables universities to individualise risk. Cambridge’s role in changes to pensions has recently come under scrutiny, as analysis by LSE professor Michael Otsuka has alleged that the University pushed for USS pension reform to reduce its individual financial liabilities. The Universities and Colleges Union (UCU) estimates that over 1 million students will be affected in 64 universities nationwide, and that strike action will amount to a total of 575,000 undergraduate teaching hours lost. Almost 70,000 students at more than 30 universities in the UK have signed petitions demanding financial compensation from universities for the lost teaching time. The UCU has also warned that if no agreement is reached, they may extend the strikes to examination seasons. UCU General Secretary Sally Hunt said that as vice-chancellors have shown little signs of movement, the union has preliminary plans for another series of strikes between April and June. The UCU’s mandate for strike action is valid for six months.